← Guest blog – Fly me to…Wagga Wagga! 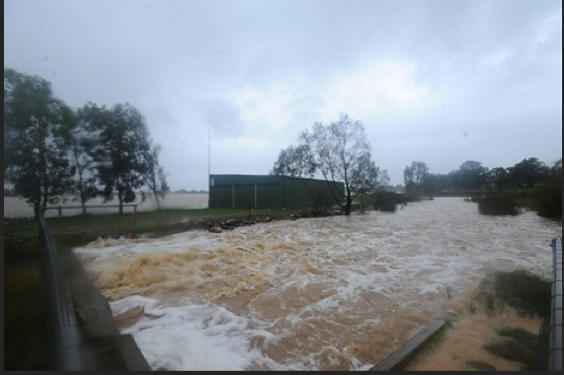 When we first visited Wagga in early December 2010, it was a bit of a disaster zone. The 10 year drought had just ended, not with a whimper but with the skies around New South Wales opening up and wreaking havoc on the dams and rivers and the towns through which they flow. 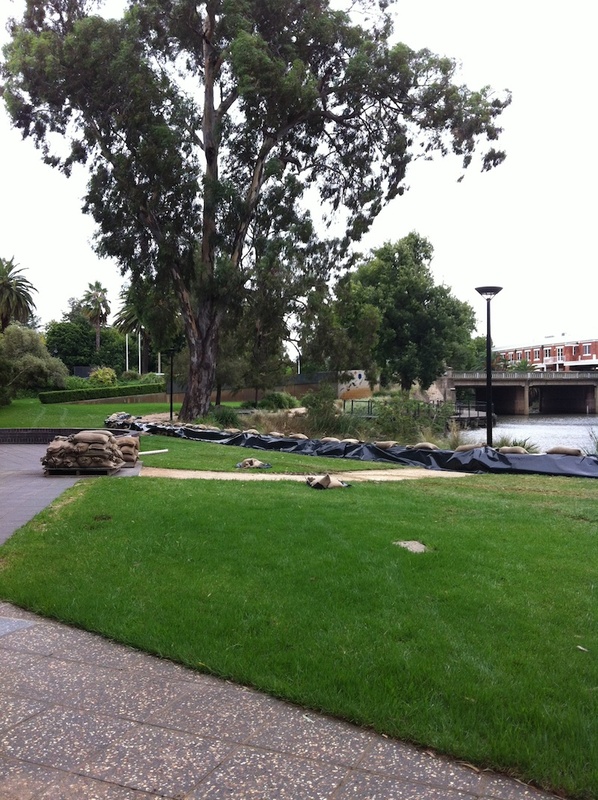 On that visit, we saw the Murrumbidgee hit almost record levels; the Wiradjuri Bridge became impassable, North Wagga was cut off from the rest of the city, and on one evening Fitzmaurice Street became a lake. The library and art gallery both suffered severe damage when the Wollundry Lagoon overshot its banks. While we had hoped to see a great exhibit of contemporary Aboriginal sculpture, all we saw at the gallery was sandbagging. They weren't taking a chance after last year, and good thing too because early Saturday afternoon the lagoon overflowed on the north side...but so far the barricade has protected the gallery that is the south of the lagoon. Laurence was being very polite in her description of what we did here. We had a lot of plans – Wagga and regional Australia can be very interesting and fun, even for a 13 year old girl – but they got scuttled by some of the biggest downpours in 130 years (!) in New South Wales. When our guests arrived in Wagga on Tuesday evening, the weather had just started to deteriorate. The weekend had been 35 and sunny. Tuesday it was about 23 and we got about 15 mm of rain…that was a good day for the week! 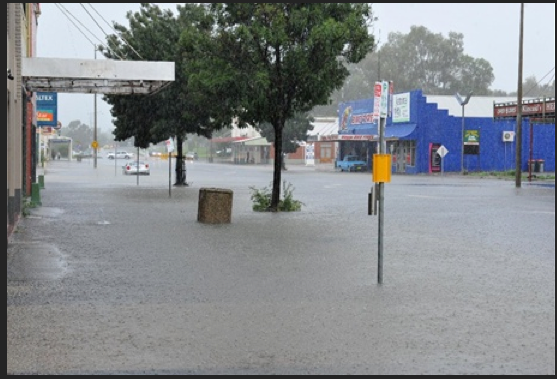 New South Wales was getting hit with a series of rain events that were breaking records. On Wednesday, one of the little towns near by (Coolamon) got over 120 mm, for example. Young (our fruit heaven) got about that much over Tuesday and Wednesday. Roads all over the place were closed, rivers were spilling over…everything was unpleasant and soggy in the surrounding vicinity. This is a little creek that runs into Lake Albert. In 8 months of cycling past it, we've never seen water in it. Wagga didn’t seem too bad though. It was raining a lot, and hard at times, but most of the roads were still passable. We had to detour once on the way home from work, and some of the roads we regularly bike on were under water but we weren’t riding anyway. We had plans to go to Canberra for the weekend; there is a nature reserve just south of there where we hoped we could see a koala. But quite early in the week it was closed down, and the rivers in the Canberra area were among the first to be predicted to hit flood levels. And there was a lot of rain in the forecast: most predictions said anywhere between 100 and 300 mm over the course of 4 days. They couldn’t get too precise, because storms like this are often quite localized, but in general you could figure that wherever you went would be wet. So we did a bit of thinking and decided it wasn’t worth it. We cancelled our hotels, changed their flight, and hunkered down in Wagga as it poured on Wednesday and Thursday here and all around us. Over those two days, we got about 100+ mm of rain, which is a lot in a country where the land is hard and the water doesn’t soak in well. 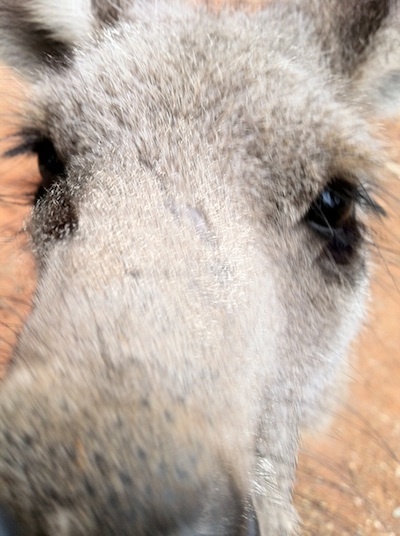 OK, so we didn't get to show our visitors kangaroos in the wild, but you can't get this close to them outside of a zoo. And it wasn’t just us avoiding the rain. Even the kangaroos and parrots, which are normally quite abundant, were in hiding. We checked a couple of times in the places where we often see ‘roos grazing, but they weren’t there. They must have been sleeping under some bushes somewhere, trying to keep dry. Hence, the excursion to the Wagga Zoo to see animals that we should have been able to see au naturel. At least when we were there we did see some free-range rosellas hanging out in the trees. Laurence enjoyed the captive kangas and emus and other birds, but we more enjoyed the fact that we could show them some of the real native birds out in the wild…for us, those few wild rosellas in the gum trees were more important than the zoo animals under them. Saturday afternoon in Wagga...not a normal afternoon though, as normally there would be people shopping here. Our beloved Knights Meats deli is just past the blue building. This graph shows the water level in the Murrumbidgee River at Wagga. As you can see, it has gone up in the past couple of days. 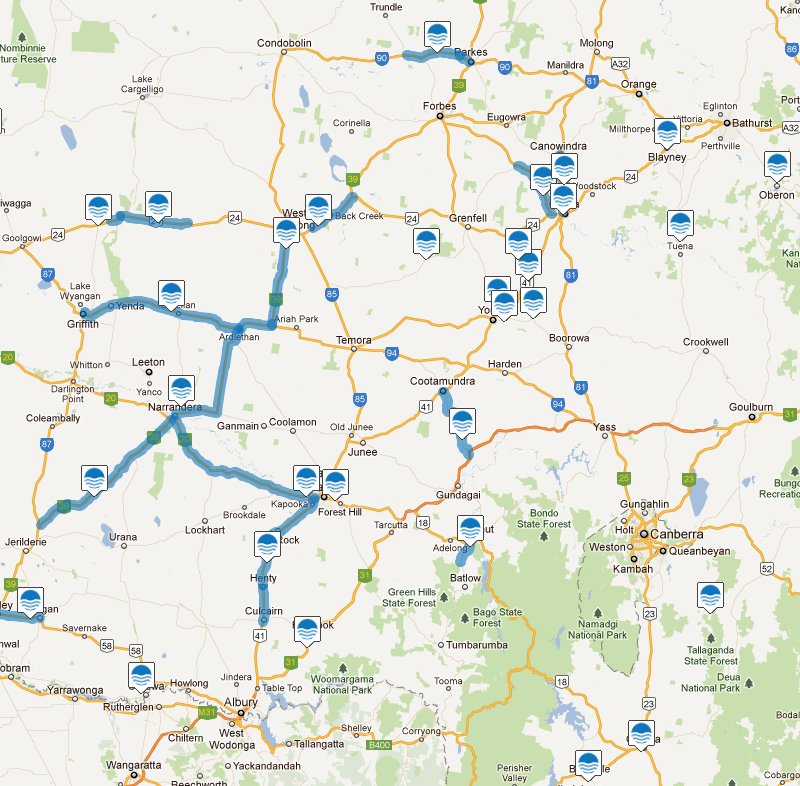 This is the NSW Road and Traffic Authority map of flooded and closed roads in our area. Update: it is now Sunday morning and it continues to rain. It has slowed down though, and the forecast is for it to end today. We’re at 75 mm for the past 24 hours. In the first 4 days of March, we have received more rain than Wagga normally gets in January, February, and March combined. More towns nearby are being evacuated, including one (The Rock) where they are busing residents to Wagga because the highway isn’t safe for cars. And the river is over 8 m now, with no real end in sight. And as we write…another town (Uranquinty) got an evacuation order. This entry was posted in Canberra, floods, lake albert, Lockhart, rain, Riverina, travel, visitors, weather. Bookmark the permalink. Be safe. We’re thinking of you two.